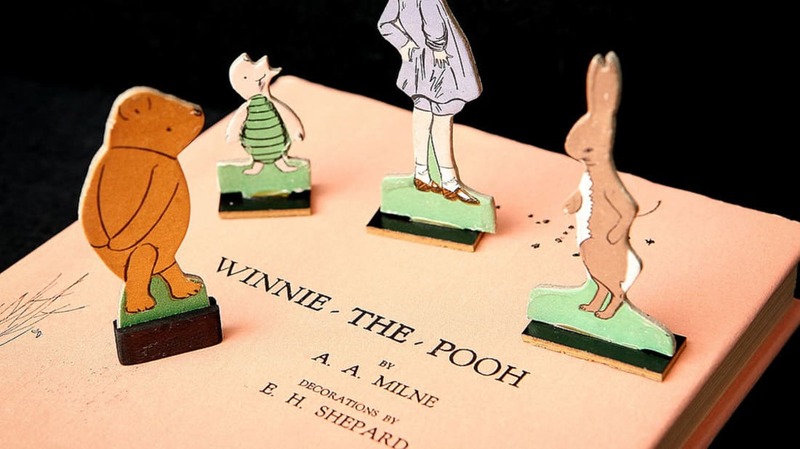 To pay tribute to both English author A.A. Milne and his lovable bear, Winnie The Pooh, we've compiled a collection of incredible facts that even the most dedicated visitor to the Hundred Acre Wood might not know. 1. THE CHUBBY LITTLE CUBBY WAS BASED ON A REAL, YOUNG ONE. During World War I, a Canadian soldier named Harry Colebourn made a pet of a black bear cub he bought from a hunter for $20. Named Winnipeg—or "Winnie" for short—the bear became his troop's mascot and later a resident of the London Zoological Gardens. There, she was an adored attraction, especially to a little boy named Christopher Robin Milne, son of author A.A. Milne. In fact, the boy loved Winnie so much that he named his own teddy after her. 2. CHRISTOPHER ROBIN MILNE INSPIRED HIS FATHER'S GREATEST WORKS. In the 1920s, A.A. Milne began writing collections of stories and poems that became the books When We Were Very Young (which introduced a bear named Edward and a swan named Pooh), The House at Pooh Corner, Now We Are Six, and Winnie-The-Pooh. It was these stories where Christopher Robin’s adored toy animals Pooh, Tigger, Piglet, Eeyore, Kanga, and Roo made their literary debuts. Most of the original toys can be seen on display at the New York Public Library—except for Roo, who went missing in an apple orchard in the 1930s. The likes of Owl and Rabbit were included to loop in some of the fauna that frolicked outside the Milne family home. 3. ILLUSTRATOR E.H. SHEPARD AMBUSHED MILNE FOR A JOB OF DRAWING POOH. Shepard and Milne shared a mutual colleague in English humorist E.V. Lucas, who believed the former would be perfect for the tricky task of bringing Milne’s fantasy world to life in delicate drawings. But Milne was reluctant to hire a political cartoonist, so Shepard took the initiative. As recounted by Milne's old neighbor, Laurence Irving, Shepard wandered Ashdown Forest, the inspiration for Milne's mythical woods, and created a portfolio of sketches. Then he turned up unannounced at Milne's home, where he handed over his portfolio to Milne and won his approval. 4. A.A. MILNE WAS A SOLDIER AND A PLAYWRIGHT BEFORE POOH DOMINATED HIS LEGACY. In World War I, he served in the Royal Warwickshire Regiment before being conscripted to Military Intelligence as a propagandist. His experiences inspired Peace With Honour, which denounced the war. He was an assistant editor at the magazine Punch, which is how he came to get involved with Shepard and Lucas. And between 1903 and 1925, Milne published 18 plays and three novels, all before publishing a word on Winnie the Pooh. 5. WINNIE'S LATIN TRANSLATION IS THE ONLY LATIN BOOK TO EVER CRACK THE NEW YORK TIMES BEST SELLER LIST. Titled Winnie Ille Pu, the 1960 release translated by Dr. Alexander Lenard stayed on the coveted list for 20 weeks, and ultimately demanded 21 printings, selling 125,000 copies. This accomplishment spoke in part to the book itself, which the Times called ''the greatest book a dead language has ever known.'' But it's also evidence of Pooh's popularity. The adventures of this honey-loving bear have been translated into more than 50 languages, including Afrikaans, Czech, Finnish, and Yiddish. 6. THE REAL CHRISTOPHER ROBIN RESENTED HIS FATHER, AND POOH. Being forever the tender little boy in Hundred Acre Wood didn't suit Christopher Robin Milne. Like his father before him, he became a writer, but wrote memoirs of his own life, like The Enchanted Places, Beyond the World of Pooh, and The Hollow On The Hill. In these, he asserted, "It seemed to me almost that my father had got where he was by climbing on my infant shoulders, that he had filched from me my good name and left me nothing but empty fame." Ouch. 7. A PRODUCER WHO PURCHASED THE POOH RIGHTS ADDED HIS SIGNATURE RED T-SHIRT. For nearly 30 years before Walt Disney began animating the bear, the American producer Stephen Slesinger acquired Pooh's merchandising rights for the U.S. and Canada. The red t-shirt that is now a Pooh signature was drawn in 1932 for an RCA Victor picture record. By the '40s, plush dolls donning the red top were being produced. When his widow, Shirley Slesinger Lasswell, licensed Pooh merchandising to Disney in 1961, the animators decided to keep the look. 8. POOH HAS BECOME ONE OF DISNEY'S MOST POPULAR PROPERTIES. In 1961, Walt Disney also purchased the motion picture rights from A.A. Milne's widow, Daphne, and so began a brand that continues to thrive for his company. A series of Winnie the Pooh shorts were released in theaters starting in the late 1960s. In 1977, a trio of these made up Pooh's first theatrical release The Many Adventures of Winnie the Pooh. The 1980s brought two television shows, Welcome to Pooh Corner and The New Adventures of Winnie The Pooh. Then the 2000s offered The Tigger Movie, Piglet's Big Movie, Pooh's Heffalump Movie and the CGI series My Friends Tigger & Pooh. There have also been a slew of straight-to-DVD releases. All this leads to merchandising profits that are said to rival Mickey Mouse's. 9. POOH ISN'T JUST FOR KIDS—HE'S FOR ACADEMICS TOO! Scholars and philosophers have been pulling from Pooh for inspiration. American author Benjamin Hoff wrote both The Tao of Pooh and The Te of Piglet to explain principles of the Chinese philosophical school of Taoism. Scholar John Tyerman Williams responded with the long but self-explanatorily titled Pooh and the Philosophies: In Which It Is Shown That All of Western Philosophy Is Merely a Preamble to Winnie-The-Pooh and Pooh and the Psychologists. And English professor and author Frederick Crews penned The Pooh Perplex and Postmodern Pooh, which satirized academic trends in case studies. 10. 2011's WINNIE THE POOH FEATURED THREE A.A. MILNE STORIES THAT HAD NEVER BEEN ADAPTED BEFORE. Made in the style of The Many Adventures of Winnie the Pooh, this theatrical release utilized traditional hand drawn animation and was staged within the pages of a book. It also contained seven original songs written by Robert Lopez and his wife Kristen Anderson-Lopez, the writing team that would go on to pen Frozen's Oscar-winning song, "Let It Go." The movie also featured a reprisal of the classic "Winnie The Pooh" theme sung by charming chanteuse Zooey Deschanel.